This page has been created to honor the life of V'Ann Cornelius, who passed away on January 8, 2008. As you will see from the comments below, she was a tireless contributor to the world of origami, the driving force behind the PCOC conventions, and spearheaded one of the first mainstream art exhibitions of origami, which was held at the Mingei Museum in San Diego. But more than that, she was a wonderful human being, a fact that became evident to everyone she met. Visitors to the site are encouraged to submit their stories, memories and reflections (including images) of V'Ann - just use the "Add a Remembrance/Memory" link at left. You can also reply to and comment (via the "Reply to Post" button below each post) on other people's postings. Please be sure to add your name (and contact information if you wish) to the the title of your post! Despite a lifelong interest in Origami, it wan't until I was young grad student in San Diego in the 80's that I had my first in the flesh introduction to other folders. I found that there was a group in Los Angeles, but to my chagrin none in San Diego. There certainly was interest, however. One of the Grand Dames of Origami, Florence Temko, lived in LaJolla, and a number of other talented folders populated the area. However, no one had been quite able to get a group together to any extent. No one, until V'Ann, that was. Once she became interested a group with regular meeting materialized almost as if by magic. No matter what it was, the display at convention, or an exhibit at the Mingei, or anything else V'Ann did it with cool head and confident manner. I have known few people so capable. Her untimely demise is a real loss for all of us. When I first read of V'Ann's passing I thought I had misread something. I had seen her last June and didn't notice her illness. V'Ann was to me one of the special OUSA members who made such an impact on origami wordwide. As many have attested, she was significant in the making of origami a Fine Art with Museum status. I didn't know her as well as many of you had, but I think I represent the many origami lovers who knew of her and appreciated all she did to make OUSA the success it is. I thank you all for adding your memories. Thank you, Robert, for informing the Origami World of her passing. Thank you, Jan, for sharing your close times with her and making such a personal memorial. I look forward to a Special Event or Award to honor her contribution to OUSA and the Origami World. 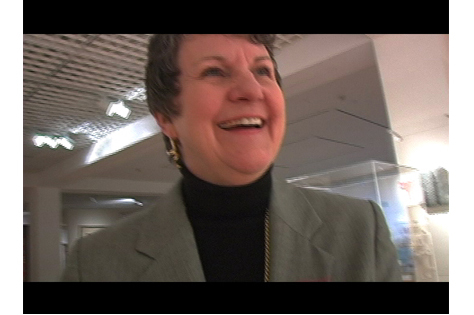 I worked side-by-side with V'Ann at Mingei International Museum in Escondido, from the day it opened - December 5, 2003 - until her last day of work there - December 20, 2007. During that time I came to know V'Ann as a person of enormous depth and prodigious intelligence, with a unique quietude, humility and above all, acceptance for what emanated from the universe - for good or for naught. It was this unwavering acceptance, an ultimate sense that we are all in the end 'powerless' that I believe fueled her strength in the last months of her life. Rather than fighting her condition, she accepted it, and with courage and determination forged on. Up until the last week of her life, she was calling me to confer on Museum matters. Her favorite phrase was, 'In a perfect world...' knowing all the while that it wasn't and therefore devising pragmatic solutions to the the problems of work and life. It isn't a perfect world, but V'Ann certainly did the very best she could with the special talents and personal qualities she was given. It seems only yesterday when Mrs. Cornelius so generously offered me the scholarship to the 2005 PCOC Convention. She introduced me to the world of supercomplex origami. Back then, only two years ago, I was folding out of 6" kami models too demanding for such unprofessional paper. Even though my creations, like the modified Lang Hermit Crab I submitted for the 2005 Hermit Crab competition, were horribly mediocre, V"Ann kindly offered me exhibit space to show off my small menagerie. I remember enthusiastically taking her PCOC classes, on vases and picture frames. I still have pictures of my experiences there in Phoenix. She introduced me briefly to Dr Lang, John Montroll, and several more origami enthusiasts. At the time I had no idea what sort of impact her efforts would have on me. Just two months before she passed, she offered to let me exhibit my Flying Camel at the Mingei Museum in San Diego. Unfortunately it was after I received the camel back that I discovered her gone. Though I did not know her as well as I would like, I can never forget all the little things she has done for me. I deeply regret that I couldn't truly say "thank you" while she was still alive. Please excuse my very bad english. As many folders, I encount V'Ann in different parts of the planet (Charlotte & NY, Vancouver, Salzburg...) That was always with a delightful pleasure. Of course she had important place and activities in the origami world family, origami USA, Southeastern Origami Festival, Masters of Origami, Mingei. She help a lot to see origami to be better considered as an artform, but what I will keep the most in memory is the person she was. Between our different encounts, I have specially in mind a beautifull day we spend in Austria, walking together in Salzburg's full of tourists streets, visiting casttle and museums, and have a very nice lunch in a top-building restaurant, closed to the river. The weather was absolutly perfect, and we just relax at the end of the MoO. V'Ann looks in good health at that time, and was as always so gentle, so generous, always thinking to the others more than to herself. I am schocked and very sad, and present condoleances to her family. I had just finished my first walk through of the Origami exhibition at the Mingei in 2005 with tears rolling down my face. All of a sudden, a woman appeared out of nowhere and asked if I was all right . While she looked concerned at my obvious emotional outpouring, her look of concern turned to a smile that grew larger and larger as I explained why I was crying. "You see," I told her, "these pieces are just SO fantastic and moving that I feel the same way I did the first time I walked through Falling Water. I HAVE to bring this art form to my students and I want to do it as a way to teach them math." After offering me Kleenex (clearly a woman who was always prepared! ), she said, "My name is V'Ann Cornelius and I work here at the Mingei. Perhaps I can help you." Well -- needless to say -- I learned that V'Ann's idea of "helping someone" gave new definition to the term. Thanks to V'Ann's vision, generosity of spirit, time and creativity, her compassion, patience, humor (so, so dry) and gentle re-directing (great teaching technique), origami is now part of an integrated art program for elementary and middle school students called "InCreasing Math." Because of V'Ann's enormous help (along with the support and technical skill of Arnold Tubis, Galen Pickett and several others), origami is becoming known among K-12 educators in Southern California and has directly been used as a math integrated curriculum with more than 250 students, with another 500 to be served just this year. After demonstrating double digit gains in math performance (via CST scores), more schools, states and corporations are supporting this program. Thanks to V'Ann, origami has become recognized as an art form and now as an educational tool to engage students in the real life application of learning math. V'Ann was such a GIFT to all of us at Dramatic Results. Her name and legacy will live on in students' lives for many years to come. Thank you for sharing yourself, V'Ann. I'm not an Origami artist, and that artform did not bring me to V'Ann. I met her many years ago when she and her husband John sang in the La Jolla Symphony Chorus. I last saw her at the Mingei Museum in Escondido maybe three years ago; we were both happy to renew our acquaintance. V'Ann was a lovely, interesting woman with deep inner beauty. I'm saddened about her passing. She will be missed by all of her former choral colleagues. I met V'Ann mostly through volunteering for exhibition tear-down at the OUSA conventions in NY. I was impressed by her grace under pressure and her very clever but often simple models for constructing display spaces (walls and shelves and stands). Her models were on display everywhere, in the background, letting others shine. Conventions are a hectic time and I did not get to know V'Ann very well. I count myself lucky to have known her the little I did, and will miss her grace and presence. Along with so many others, I wish to extend my deepest and sincerest condolences to V'Ann's family and all of us in the origami community who had the good fortune to know and work with her. Her devotion to origami and the countless hours she dedicated to all of the exhibits at our conventions and other events will be sorely missed. I learned so much from her about the preservation of our precious paper creations, how to display them, and even more importantly, how to store them. She put together teams of dedicated volunteers, myself included, to follow her precise methodologies for setting up and tearing down exhibits, and we worked tirelessly to reach her goals of perfection because of the dignified, knowledgeable, and commanding personality that she was. I am shocked and saddened by her loss. I had so looked forward to honing my exhibition tear-down skills under her superior, irreplaceable leadership. I will never do that task again without thinking of her and trying my best to do her proud. Thanks, V'Ann, for your friendship and guidance; peace be with you. At the 2005 Origami USA convention in NYC, I displayed a large 8 foot diameter geodesic dome. I want people to know that if it were not for V'Ann, that dome would never have existed because it was her idea, not mine. I was planning to bring a small dome that could be preassembled and driven down in a car. She had the idea of going for a really big dome and provided all the inspiration and encouragement to go for it, patiently listening to all my concerns about the size, the logistics, and even the fear that such a dome, untested, would just collapse during the exhibition. It makes such a huge difference when there is someone there who just believes in you. I'll miss her very much. It caught us completely by suprise that V'Ann has passed away. It seems like yesterday when we welcomed her in Salzburg/Austria at Hangar 7 for our exhibition Masters of Origami. She was the most supporting and positive Co-Curator someone could imagine. I can not tell you how much of a pleasure it was to work with her for almost a year to put together our project. It all started with visiting her in San Diego and an amazing tour her husband gave me on a little plane over the city - an unforgettable memory ... unforgettable as much as V'Ann will be. The world would be a much better place with a lot more people like her! community will be missing her tremendously. My sincere condolences go out to her family. I will always be grateful for V’Ann saving me from humiliation. I sent her my plan for the exhibition at the conference, which resembled a child’s cluttered toy box. She helpfully and tactfully steered me to a more organized, quality display. When I arrived at the Conference the airline had lost my luggage containing the display stands and I was worried about laying the models down on the table (Airplane models belong in the air.). V’Ann suggested that I setup the display without the stands and if my luggage made it in Friday night, I could easily mount the models early Saturday morning. All turned out well in the end, as the luggage with the stands arrived and the display was saved. In addition, I had this unusual flower with no place to display. One of the exhibiters failed to show up that morning and V’Ann allowed me to use his display space. I would like to dedicate my design of the Peruvian Lilly to her memory. I last saw V'ann at the recent PCOC in Vancouver. I knew she was sick, but did not know why. I took 2 classes with her that weekend, and felt honored to be in her presence. I had never had her as a teacher, although I have known her since about 1997 when I started attending OUSA conventions in NYC. Her warmth and good humor in the face of her illness was truly remarkable. She had her class well attended and kept giving new suggestions and ideas on ways to expand on what she taught, encouraging us to experiment on our own. The mark of a great educator. I will always remember V'Ann during OUSA, letting me in with my camera to the display area, usually at 830 in the morning or just after I had gotten my tickets for that days classes, to photograph the models on display. As we all can attest to, time telescopes at these conventions and there is just too much too do and too little time to do it. The space was usually empty at that hour and I could photograph the entire display at that time. I also remember her one year helping me arrange my display by providing folded boxes and other display elements to give it a classier look. I will certainly miss her helpfull ways and her smile and energy at convention. OUSA and conventions will not be the same. V'Ann was a tireless supporter of the origami community and of OrigamiUSA and worked to support local area groups all over the country. But most notably, she, more than probably anyone else in the U.S., is responsible for bringing origami into acceptance in the mainstream art world; not only through the groundbreaking "Origami Masterworks" exhibition at the Mingei and various follow-on exhibitions, but also through her devotion every year to the exhibition at the OrigamiUSA annual convention and her unswerving attention to the quality of the exhibition and presentation. Personally, I will greatly miss her unflappable good nature and flashes of wry wit which often caught me off guard and were delightful. She will be sorely missed by all of us. V'Ann had spent quite a number of hours in our dusty fourth floor office in the American Museum of Natural History gathering data and information for what became the Origami Model Index. The idea, of course, was to put all the data into a computerized database. In my usual " Yes, but..." fashion, I remarked that there were many members who had no computers. Could there be a printed copies available? suggestions, Bernice. I'll be happy to hear any other thoughts you have on the Index/Catalog. Happy folding, V'ann. And there they are, several printed copies of the Origami Model Index which V'ann sent from her home in California. My treasures along with the pleasure of having known the gracious, charming V'ann. Services for V'Ann will be held at St. John the Evangelist Catholic Church in Encinitas at 10:00 a.m. on Monday, January 21, 2008. The church is located on Encinitas Boulevard about a mile east of Interstate 5. A reception will be held at the home of V'Ann's niece, Debbie Galasso. If you plan to attend, please send an email to John Cornelius at jc [at] lht.com so that he can make sure they have an idea of how many people will be there. I first knew V'Ann during the 1980's and 1990's only through the mail as a corresponding member of FOLD, a privately circulated origami interest magazine. I did not have the privilege of meeting her in person until 2000, when Charlotte and I moved to the San Diego area. I am greatly indebted to V'Ann for immediately getting me involved in many activities of the San Diego Origami Group and Origami USA. In my first meetings with her, I was immediately struck by her quiet enthusiasm and energy and her creative ingenuity in practical origami design, including in particular her vehicles for effective origami display, now known throughout the world. I was also impressed with her ingenious design of isosceles triangular boxes (she called them "pie boxes") from arbitrary rectangular strips, and we had a lot of fun generalizing her design to arbitrary apex angles. This was the first of my many joint folding adventures with V'Ann. I have had the pleasure of working with V'Ann on planning committees for the 2003 (San Diego) and 2005 (Phoenix) PCOC's and 4OSME (Pasadena), and numerous origami workshops for K-12 students and teachers. I marveled at her quiet and always dignified proficiency in handling all aspects of conference organization facilities, budget, program, and registration. For as long as I can remember, she has been the "registrar" for Origami USA events including the Vancouver PCOC in November. In workshops, she displayed a natural ability to adjust the presentation to the level of her audience. She gave extremely clear folding instructions in a variety of formats by demonstrating folds, passing out folding instructions, directing the folding in silence, and most importantly, challenging her audience members to work out generalizations of the models using reasoning appropriate to their backgrounds. On more than one occasion she gently reprimanded me for helping students too much and therefore not allowing them to discover with their own minds and hands the way out of their folding difficulties. I had the opportunity of witnessing the final stages of V'Ann's long and ultimately successful struggle to mount, in 2003, a world class exhibition of origami at the Mingei International in Balboa Park, San Diego. As has been mentioned by many persons in memorial tributes, the landmark origami exhibit at Mingei International has spawned a host of similar museum expositions throughout the world. In the past year, V'Ann and I, along with Galen Pickett of California State University, Long Beach, have been involved with the organization, Dramatic Results, in establishing a 12-week program in origami-mathematics for fifth and sixth grade students in the Long Beach School District. In spite of her declining health, V'Ann organized several very successful teacher training programs prior to the launch of the program, which has now been run twice. Preliminary evaluations of pre- and post-testing results indicate the great potential of origami as a tool in early mathematics education. Under the dynamic leadership of Christi Wilkins, Dramatic Results is now planning to extend the program to 24 weeks and is vigorously seeking both foundation and US government agency support. The nationwide expansion of programs such as this would be a great testimony to the many years of effort that V'Ann spent giving workshops in school classrooms and libraries. On the day before she passed away, I visited V'Ann, whose home is only a ten-minute drive from mine. She was surrounded by John, her mother, her sister, her children, and other members of her family, many of whom had spent Christmas with her. Although she was very thin and frail, and had difficulty in speaking, any initial surprise that I may have had upon seeing her condition quickly evaporated when I experienced her gentle smile, remarkable lucidity, and interest in what was being said. The origami world today thrives on the works of its extremely talented creators. However, the recent elevated status of origami as a genuine art form owes a great debt to V'Ann who for many years tenaciously pursued her dreams of origami as medium worthy of display in world class museums. Hopefully, her visions of the widespread adoption of origami as a vital tool in early mathematics education will soon be similarly realized. I and my husband saw V'Ann every summer for many years when we attended the Origami USA Convention in New York City. Her quiet gentle way of getting things done impressed me a lot. She was always so well prepared and always found a way to accommodate everyone. I feel privileged to have known and to have been able to help her each time I was at the New York convention. She made a tremendous contribution to Origami USA and will be greatly missed by those who are associated with this organization that she cared for so much. V'Ann was one of the very first people I met in the origami community. She greeted me at the Mingei Masterworks exhibit with excitement, warmth and great enthusiasm. We toured the collection and she shared with me her infectious love for the artwork, piece by piece - careful not to miss a single model. . . She offered funny stories, anecdotes and context about each piece and its creator, exemplifying her incredible devotion to the community and its core principles: sharing, wonderment, and joy. And as I met more and more people across the US and Europe who knew and loved her, I learned that she had this same infectious effect on everyone she met. I'd like to extend the thoughts of all of us at Green Fuse Films to her family and friends, far and wide. Here is a tribute to V'Ann that I posted last night on the Origami List ((Origami-L). Anne LaVin has asked subscribers to repost their memories to this special page on the Ousa web site. V'Ann's husband, John Cornelius has already graciously replied to my message. When I read two weeks ago of the tribute paid to V'ann at the Escondito Facility of the Mingei Museum, I was immensely glad for her. Yet, I also read that she was in a wheelchair and, I sensed that all was not well. I am shocked to learn how very quickly my anxieties have materialised and I feel so sorry that she has departed from us so soon and at such an early age. My heartfelt sympathy go out to her husband and children. I may be wrong, but don't think that V'Ann ever came to England to attend a convention of the British Origami Society. If not, this was our loss. But I did meet her several times at two conventions in New York and at an OUSA Conference in San Francisco. The first time was in 1995, when John Smith and I had newly arrived in New York and were settling into our rooms before the convention started. She was the first one to come to our room to greet us, very warmly. We also visited her in her own room, along the corridor, where we found her deeply immersed in organising the convention with the help of her laptop. I again came to New York for the Convention in June, 1997, where I met her once more and later that year attended the first PCOC at San Francisco, where V'Ann was again busy with the organisation. Following my visit to San Francisco I travelled south to San Diego to visit Florence Temko. V'Ann also lived in the area. There, at a Saturday afternoon meeting for local folders in a small local library, I met many of the local folders. Thanks to V'Ann, and others, San Diego was to become a very active and creative centre for Origami. During my visit to San Diego, I visited the Mingei Museum (or rather, it was the new Mingei Museum because it had recently been magnificently rebuilt. I knew that the Mingei had previously had associations with papercrafts and my immediate object was to inspect Florence Temko's splendid gift of origami books to the Museum. On this occasion there was no exhibition of origami taking place but there were many interesting exhibits to inspect. In 2003, the Mingei held its great "Origami Masterworks" exhibition. This was the finest exbibition of Origami, ever to have taken place. Nothing of this range or scale had ever taken place before, even taking account of the great exhibitions of the work of Yoshizawa in Japan. V'Ann was heavily engaged at the centre of its organisation. My last meeting with V'Ann was at the Masters of Origami Exhibition in July,2005 at Salzberg in Austria. V'Ann didn't organise the meeting itself, but on the strength of her organisation of the Origami Masterworks Exhibition at the Mingei she had been invited to Salzberg to set up the exhibits. At Salzberg, she was appointed Co-Curator and I found her very busy everywhere organising the displays But as always she remained in the background and she never sought any of the glory. More recently, beginning early in 2007 and still continuing at the present time the Mingei has been holding another exhibition of paperfolding, with the name of "Paper Transformed". This time, V'Ann was appointed to be the Curator of the exhibition. Once more, the exhibition has proved to be an exceptionally popular one for the Mingei, which is now established as the leading origami museum in the world, Could this ever have happened if V'Ann had not lived in the area of the Museum? To our sadness, we now know that much of this time, unknown to us all, V'Ann was hiding the shadow of the illness which eventually took her away from us. All this time, V'Ann was also acting as a regional member of the Board of Origami USA and helped to hold that organisation together through periods when the tensions between the Board, based, (like the earlier Origami Center, in Lillian Oppenheimer's home city of metropolitan New York), and the regions of the United States, which threatened to tear the organisation apart. Throughout this time V'Ann stood steadfast and continued, loyally, to work for OUSA as a whole and also to contribute to the success both the New York Conventions and also to the Pacific Coast Conferences. But she was very much a back-room worker and sought no self-credit for her own achievements. Her total contribution will probably never be known, even to those who were closest to her. Fortunately, in the nick of time, realisation came to a few people and on 28th December, 2007, both the Mingei Museum and Origami USA announced unprecedented awards to V'Ann, at the Facitlity of the Mingei Museum at Escondito. This was a facilitywhich she herself had been instumental in creating. There,Origami USA announced the creation of the "V'Ann Cornelius Award for Regional Groups" and The Mingei Museum formally renamed the Museum's collection of origami books, the "V'Ann Cornelius Origami Collection". V'Ann attended the event with her family. She was confined to a wheelchair, but she clearly enjoyed the occasion. V'Ann died just twelve days later on 9th January. From the start of my subscribing to Origami-L in 1996, V'Ann was always "there" and I frequently exchanged e-mails with her on all manner of topics of Origami. I confess that one of the first things I impertinently asked her was about was her unusual name. She happily explained told me that her name had been chosed by her father and it was intended to be pronounced in two parts: the "V" as in the letter "V"and followed by the more usual name of "Ann". it was certainly a distinctive name for a distinctive person! I shall miss her, as will so many who have had anything to do with international origami during the past twenty years. But we shall always have Origami and as long as we have origami, V'Ann will always be with us. This is the text of what I said at the Mingei gathering honoring V’Ann December 28th. Here’s my personal mental photo album of V’Ann Cornelius. The first mental picture … well, it must have been about 1988 or 1989. Michael Shall had finally ceded control of the convention, and there were a bunch of us trying to figure out how to do all the work that had been done by one man. In walks a quiet woman. How can I help, she says. She started out making copies and soon made herself essential. In those days we often had an annual saint – a member who came from nowhere and helped tremendously for a few days. Often, after the convention the disappeared back into the mist from which they’d come. But not V’Ann. Gradually she took on more and more responsibility, and soon found her calling in organizing and displaying our exhibition. Her artistic eye and calm demeanor made her perfect for the job, and each year the exhibition got better and better, and the displays more and more sophisticated. Next photo is sitting up in bed in the middle of the night in Otsu, when jet lag had hit, talking and laughing and waiting for sleep. Then there are a group of mental photos of V’Ann saying “OrigamiUSA should do …” something, and then doing it. Unlike some of our members, when V’Ann said “we should” she didn’t mean “someone else should.” So there she is establishing the first origami model database. And there she is with John, initiating and supporting our own web server. And writing a regional group handbook. And lots more ways she’d found to support the organization from a distance. Perhaps most important she made us New Yorkers realize that people outside New York could take on responsibility and get things done; that it wasn’t distance that mattered, but character. Let’s turn the page and find a group of photos of me with V’Ann and Vicky Mihara Avery. The two of them saying: let’s have a West Coast convention. And the three of us (with lots of help) making it happen. From the first one in San Francisco where we learned a lot about Pacific Coast Origami Conferences to the last one in Vancouver, where we learned even more. The three of us in a car for three days making a whirlwind tour of potential sites for the 3rd Origami Science and Math conference. The three of us in a suite working … well, lots of photos of us working, and lots of photos of us laughing. And there’s V’Ann at the Mingei, taking the idea that Florence Temko and Martha Longenekker had nurtured for years of an origami exhibition, and making it happen, magnificently. And, since this is my mental photo album, there’s a picture of me, V’Ann and Vicky spending a weekend making larger and larger prototypes, and then a 9’ version, of the shadow columns that graced the entrance to the exhibit. Over the years there were too many times to count that V’Ann said “we should” and then did it. And did it calmly, efficiently, and with lots of laughter, and lots of love. But most of all in my mental photo album there are lots of small pictures of me with V’Ann over the nearly 20 years I’ve known her: talking quietly, smiling, just being friends. Thank you, V’Ann. Written by Jan Polish, posted on January 10, 2008.